We’re in the middle of a food revolution: veganism has risen by 360% in the past ten years in the UK. But where should the discerning Londoner go if they want to join in with Veganuary this month? From stalwarts of the scene to fresh new faces, we’ve rounded up the restaurants with the best-tasting vegan fare in town. Black Cat is an East London favourite, known for their bright, well-portioned salads and soul-warming soups. Hidden away just off Clapton Square, the cosy volunteer-run café is cheap as chips and has a menu that covers much more than just that. They’re open ‘til late and you can also buy tons of vegan treats and inspiring books (cookery-related and not) to take home. Brand-new on the south London plant-based scene, The Meet’s deal is in vegan comfort food and great cocktails, featuring whimsically-named dishes like the ‘Jerkin’ Around’ tofu wrap and the ‘What a Mess’ jackfruit chilli alongside a particularly vibrant drinks menu. To make sure everyone’s getting the most out of all those yummy cocktails, they also host bottomless brunches on Saturdays, followed by a roast the next day to work them off. Check out what we thought when we visited The Meet here! Itadakizen takes its food seriously, seeing food as important not only for its taste but for its healing qualities (zen means ‘to heal’ or ‘to mend’). But they don’t skimp on the taste either, and what a treat it is as a vegan diner to step into a Japanese restaurant and know you can order anything! The restaurant also regularly holds events such as art exhibitions, live music and free food workshops. The unfaltering saviour of London’s herbivore community, established in Soho since 1988, Mildreds has now expanded to Camden, Kings Cross and Dalston to spread the delicious, vegetarian love. These days, though the menu changes often, the vast majority of Mildreds dishes are vegan. Special mention should go to their staple soul bowl – being good never tasted so, well, good. Mildred's don't take bookings, so head on a weekday or be prepared to wait. Fed by Water deserves a place on this list simply for the audacity of its concept – vegan Italian food, cooked using only purified water, with a seasonal menu using local suppliers. It’s quite fun to visit just to see how it’s even possible to achieve a vegan carbonara, or vegan cheesecake (cleverly named the ‘cheese fake’). There is also a nice selection of homemade smoothies and lemonades. Of course, it’s not easy to be this virtuous and keep prices down, so make sure you don’t come just before payday. What to do, as a vegan, when plain old chips don’t feel sloppy enough for a drunken midnight snack? Well, you head to the Temple of Seitan, now known Temple of Camden and Temple of Hackney in its two different locations, where you can pick up jam-packed, drool-worthy burgers, wings dripping in sauce or even a two-piece, all sans any animal products. They even do a cute little snack pack: half popcorn bites and half chips. You’ll need never look wistfully at the exterior of a packed KFC at 3am again. 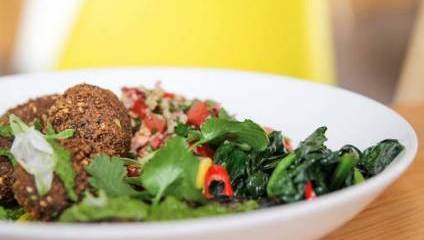 The Arancini Brothers’ unassuming range of cafés hide real delights within: totally vegan burgers, wraps, salads and stews all based around their crunchy, creamy, chewy and completely charming risotto balls. Perfect for a lunchtime treat on a Friday, there are a million variations to try out, with “chicken” and “chorizo”, but their humble plain salad does it best, with plenty of chunk and mouthwatering sauces. And if you really want to cut out the middleman, you can also simply order ten risotto balls to enjoy solo. Stem + Glory, which already has two branches in Cambridge, will be launching in London this month with more of their signature casual-fine vegan dining.